Here are some creative formative assessments for this beautiful Friday! Get children using their critical thinking skills to synthesize their knowledge and apply what they have learned. These ideas can be used in any subject. Students design an ad (for a magazine, a website, a poster, a billboard…), creating the text and visual content for a newly learned concept. Students compose a poem to describe a composer, scientist, explorer, literary character, etc. An example for structuring the poem is in the downloadable version, but it can be adapted to fit different levels. Provide the students with a common misconception about a topic. Challenge them to justify why they agree or disagree. Break the class into cooperative groups. Provide each group with a topic (a theme, character, concept, historical figure, process, etc.). Each group should act out a scene that gives insight into their topic. Students draw a picture that illustrates the relationship between two new terms, and caption to explain the illustration. Ask the students to write two open-ended questions related to the new learning. The students should aim to write higher-level thinking questions, as appropriate for the age level. Then each student exchanges with someone else, who will answer the questions. Assign the four corners of the classroom as “Strongly agree,” “Agree,” “Disagree,” and “Strongly disagree.” Read some statements and have the students go to a corner based on their understandings and opinions. Choose a student from the “agreement” side and one from the “disagreement” side to justify their choices. Have students write their responses to a question or provocation on the board. Then ask students, one by one, to cross off one that does not fit, explaining why. Ask students to write a journal entry from a different perspective: that of a book character, a historical or contemporary figure, or even an inanimate object. Click here for a downloadable version of the list. 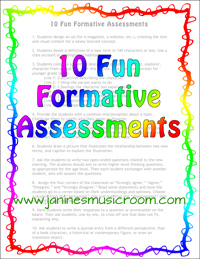 Looking for more formative assessment ideas? Check out these Exit Slips, or a comprehensive Formative Assessment Mega-Pack with over 100 different ideas, printables, and tips for using formative assessment. You also might want to check out these 50 digital tools for collecting feedback on learning.